When governments in developed countries began to fund photovoltaic projects, they missed the uniqueness of the technology and treated it like any other generator of electricity, tending to favor large-scale centralized over building-by-building installations. But the modular nature of photovoltaics allows solar cells to be tailored for the electrical demand on-site, avoiding both the capital costs of building a centralized power plant and the power losses that occur in transmission. Furthermore, photovoltaics, unlike such power plants run by turbogenerators as gas-, nuclear- or oil-fired electrical plants, do not benefit from increasing size. Instead, the price of solar cells drops as the number of modules produced grows, whether the increasing numbers come from installing them in a centralized station or at multiple sites. To demonstrate these points, in 1987 Markus Real, a Swiss engineer, went head-to-head with a recently installed one-megawatt photovoltaic plant installed in California, by selling three kilowatts’ worth of photovoltaic panels to 330 homeowners in Zurich. 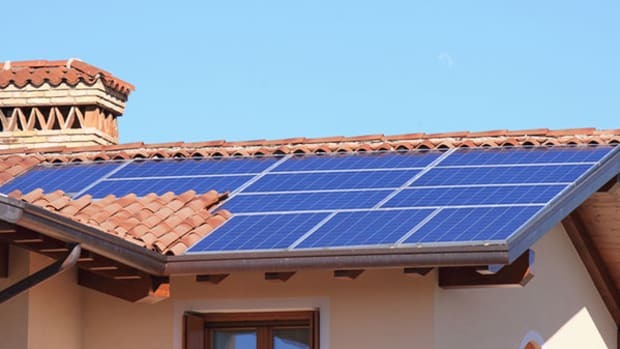 For the first time, the customers and the utility interacted in the production of electricity: Not only did the electricity from the solar cells power the houses, but when people had more than they could use, they sent it back through utility lines and received payment for their excess production. At night or during bad whether, when the panels did not generate sufficient power, the homeowners bought electricity from the utility. Here in Zurich, today’s most common use of photovoltaics — grid tie — was born. People saw the logic: Modules can be placed on the rooftop, where the building’s electrical connections are, and be directly attached. What is the cost of land and added transmission lines, as well as power losses as the electricity runs through the wires? Zero! Rooftop programs inspired by Real’s work have spread throughout much of the developed world and are responsible for increasing photovoltaic production more than a hundredfold since 1987. Switzerland’s northern neighbor, Germany, leads the world in photovoltaic installations. Its No. 1 position has nothing to do with the amount of sunshine it receives. For example, the western United States gets about twice as much solar radiation throughout the year, and Americans, mostly in the West, have installed about 800 megawatts; the Germans have put in almost 4,000. Germany’s vigor stems from government support for photovoltaics. It is part of a 2000 national initiative committing the nation “to facilitate a sustainable development of energy supply in the interest of managing global warming.” The emphasis on increasing the market for solar cells lies in the government’s belief that “in the long-term, the use of solar radiation holds the greatest potential for providing energy supplies” while not impacting climate. The long-term goal is that while the demand for electricity will increase fivefold over the next 40 years, its generation will come more and more from photovoltaics. By supporting the growth of the industry early on, the government figures, the nation will become the center of a technology that it expects will someday dominate electrical generation. Events in the 1980s shaped the German consensus toward clean energy. The disaster at Chernobyl began to move people away from embracing policies that would have led the nation toward a nuclear-based society. Watching its beloved forests die from acid rain emitted by coal plants added to the base supporting the use of cleaner sources of energy. The general acceptance early on, even by more conservative elements in German society, that burning fossil fuels caused climate change strengthened the political will for change in energy production. In this political climate, renewables became a major societal issue. It took a decade, though, for the Germans to find success. The first try to get a photovoltaic market going was a law passed in 1990 that gave consumers the right to sell electricity they produced to their local utility — at a price based on a percentage of the average market electricity price. Those generating electricity from photovoltaics received the equivalent of 11 American cents per kilowatt-hour. As the payback only reimbursed a small portion of the expense of buying panels for a household, few bought into the program. Learning from the tepid response, the national government sweetened its offer by additionally providing zero-interest loans to promote what it called the “1,000 rooftop” program. Once the numbers were achieved, the program ended, and the purchase of modules stopped abruptly. To keep the production of solar cells increasing, the national government committed itself to installing photovoltaics on 10 times as many roofs. It again offered interest-free loans as the stimulus. Few came forward. The government saw that it had to offer greater incentives if it wanted the industry to grow as it envisioned. That’s when it passed what is now famously known as the “Feed-in Tariff.” The law required utilities to purchase photovoltaic-produced electricity at a rate of over 60 American cents per kilowatt-hour guaranteed for a 20-year period. The generous offering worked. Incorporated in that 2000 initiative (“The Act on Granting Priority to Renewable Energy Sources”), the installed capacity of photovoltaics leapt from 12 megawatts in 1999 to 170 by 2003. Wanting to see even greater growth, the German government in 2004 opened the floodgates by removing any limit to the numbers participating in the program and increasing the price consumers received for generating electricity with solar cells. Installations zoomed from 500 megawatts when the law was passed to 1,260 last year. And not everything solar is rooftop — Germany is home to a number of solar parks, including the Leipzig-area’s Waldpolenz, which is planned to produce 40 megawatts once it is completed in 2009. In contrast, the United States’ largest solar plant (and third in the world), at Nevada’s Nellis Air Force Base, produces 14 megawatts. Now in its eighth year, the Feed-in Tariff law has proven to be the most effective way to encourage the healthy growth of the photovoltaics industry. It encourages innovation as the best equipment brings the consumer greater monetary compensation. It costs the government nothing. Ratepayers support the program. Because the bill for the tariff is spread over the entire national ratepayer base, the cost per person is miniscule — less than buying a loaf of bread per month. Guaranteeing the tariff for a set amount of time brings stability and predictability to the market — essential for business to thrive. As a result of the program, a German company this year became the largest producer of photovotaics in the world, while many foreign solar cell companies have either moved operations to or opened factories in Germany. It’s not all sunny in Germany’s solar industry, of course. The trade group BSW-Solar fears changes in German law could decrease the solar subsidy and is also concerned about the increasing cost of raw materials, such as silicon. Other countries, including France, Greece, Italy, South Korea and Spain, have emulated the German program. In the United States, Rep. Jay Inslee, D-Wash., plans to introduce a bill mandating a national Feed-in Tariff based on the German model. Germany’s Feed-in Tariff deserves much of the credit for prodding the world to increase solar cell production by more than 40 percent over each of the last three years. Growing capacity of the industry suggests that production could exceed 20 gigawatts by 2010 — a billion times the amount of photovoltaics installed throughout the world 35 years ago. Economies of scale and continued innovation by companies to stay competitive should in the next four to seven years make the price of electricity generated by photovoltaics equal the cost of utility-generated power.